After leading the Edmonton Oilers to five Stanley Cup championships, Mark Messier did the same for the New York Rangers, delivering their first cup since 1940. Regarded as one of the greatest captains in hockey history, Messier is a two-time recipient of the Hart Trophy and was also awarded the Conn Smythe Trophy in 1984. 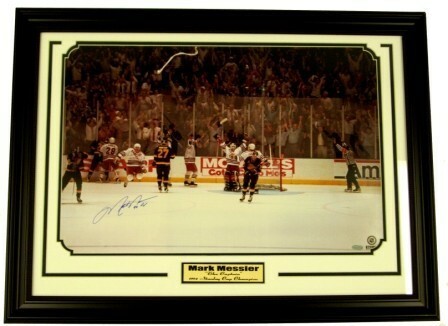 Mark Messier hand signed this incredible 16x24 photograph of the 1994 SC and has inscribed "94 Cup". A Steiner Sports Certificate of Authenticity is included. This piece has been professionally framed and matted.